Golden Buzzer, Here We Come! While we’re admittedly not the biggest fans of reality tv singing shows, we always cheer when we see talented kids take the stage, armed with big dreams and a whole lot of courage as they go before a panel of judges with their craft. 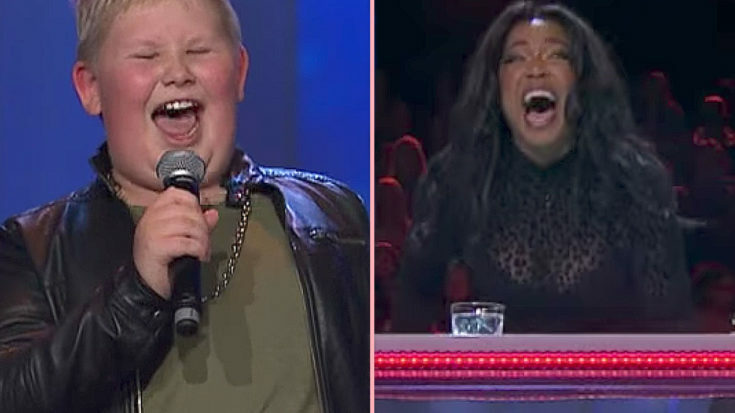 In the case of 12-year-old Oliver Rytting, not even the prospect of going before 4 judges and a packed audience was enough to deter him from his dream of winning Sweden’s Got Talent and taking the grand prize of 500,000 Swedish Krona with his showmanship and lifelong love for classic rock, ideally spending it on a recording studio and donating to the World Wildlife Fund. Fun Fact: Released as a single internationally in 1984, “Heaven’s on Fire” charted in several countries, even though it failed to reach the top ten in any of the countries where it was released as a single. We won’t spoil the results of Oliver’s journey on Sweden’s Got Talent, but we will, however, say that his performance of KISS’ 1984 classic “Heaven’s On Fire” was so good and so wonderfully endearing that there was one judge in particular that lost it completely, totally unable to contain herself throughout Oliver’s moment in the spotlight. As the audience before him screamed, clapped and sang along with him, Oliver commanded the stage with the ease of a seasoned performer – including plenty of air guitar, fist clenching, and engaging with the audience and judges for a performance they’ll never forget – and neither will you. He’s a natural performer and it’s pretty clear that he’s at home there on stage. It’s like he’s been doing this his entire life! We always find it refreshing when kids turn to classic rock ‘n roll instead of today’s music. It only shows that songs like this won’t ever go out of style. And it’s people like Oliver who help keep rock alive.